I've been moving and organizing, so I've missed enough evening chats and writing prompts in the past few weeks that I'm going to do this one anyway, after the scheduled time with the same rules applying. As soon as I saw the topic, I knew what I was going to write about. Devil's Churn, on the Oregon Coast, is a narrow inlet carved into the rocks that makes the wave crash like I've never seen before. I first visited Devil's Churn in 2008, on a whim with some buddies on our annual spring break road trip. We were looking at the map, yes a paper map, and saw this place called Devil's Churn and had to check it out because of the name alone. 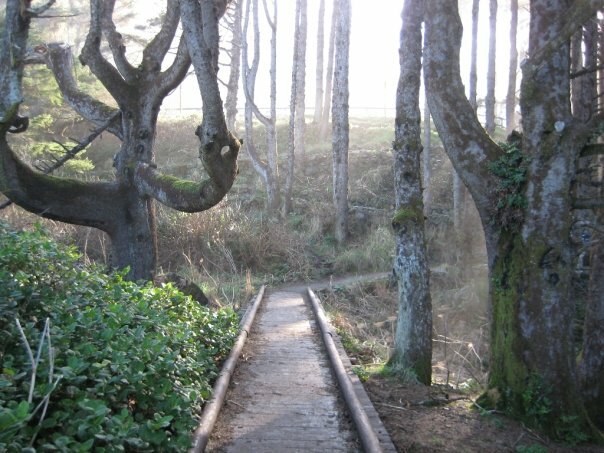 The path down to the water starts from a small parking lot and winds down through the coastal trees to the rocky coastline. Once you're out of the trees, you're standing at the edge of the Pacific Ocean with giant rocks all around and huge sprays of water coming at you. The actual inlet that is Devil's Churn is a bit wider than a human is tall at points, carved into the cliffs, and slippery as hell along the edges. We climbed on the those wet rocks, keeping our balance the best we could, getting closer and closer to the edge which satisfied our curiosity. We had never seen anything like this before. We were all from Michigan, with the greatest of lakes, but nothing like Devil's Churn. We stood on the edge, just out of reach of the majority of the spray, and watched the waves crash for at least 30 minutes. We explored all around following the rocks out to some sandy areas and getting an even better view of the ocean near the mouth of the inlet. The waves just kept crashing, relentlessly, captivating our attention each time. Crash! Trickle. Water churned around, slapping the edges but not crashing. CRASH! Another wave came in. Repeat. To witness the power of the ocean for the first time, for us, was a mind bending experience. Devil's Churn is one of those special places for me, being one of the first places I've witnessed the power of the Pacific Ocean. The following year, I was on another spring break road trip and we happened to be going up the coast and just had to stop at Devil's Churn. One person I was with was there the year prior, but we felt we had to show our newcomer the power of this place. The day wasn't as sunny or mild, but the power of the water remained the same - maybe more powerful with the excessive winds and added rain. The third, and most recent, time I decided to detour and visit Devil's Churn was in 2013 on a late summer road trip. I was with my other half and we had planned an Oregon Coast scenic tour. We stopped at many beaches and viewpoints, but I made sure we stopped at Devil's Churn. It was a rainy, gray, and cool day along the coast but that didn't stop us. We parked, took the path down and I shared the power of water with yet another person important to me. We walked down, inspected the crevice, and enjoyed the foggy beach views. We watched the water churn and crash and admired the waves while trying to keep our balance on the slippery rocks. 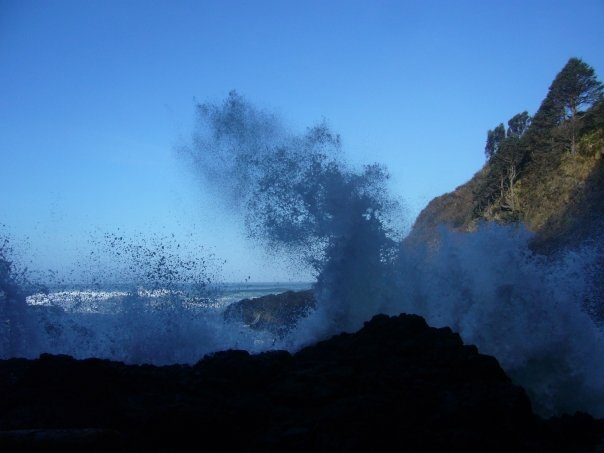 It's been five years since I've visited the Oregon Coast, and Devil's Churn. 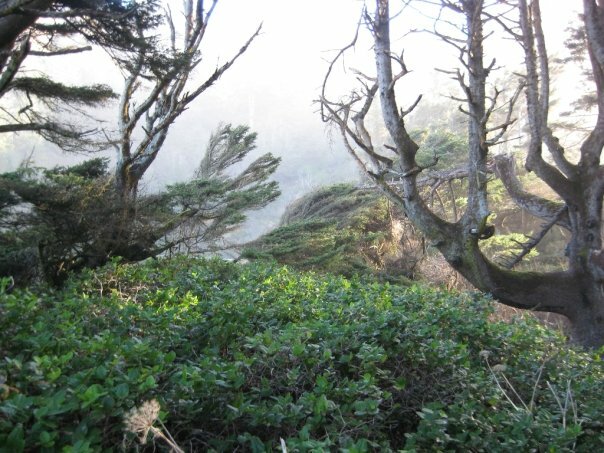 I think about the coast often, the power of the water crashing into the rocky cliffs, the trees, and the fog. I can still smell the air from those visits and it only adds to the longing I feel to return. As time moved forward, I learned about other great spots along that coast and realized we were only miles from other magnificent and powerful water features such as Thor's Well or Cape Perpetua. I hope to get back to see Devil's Churn again as well as the other gems along the Oregon Coast. *This was created in 1 hour for the Nature Writing Challenge hosted by Douglas Scott on twitter at #NatureWritingChallenge.